There are several superlatives that I can describe the Norwalk Juicer, it is the bulkiest, heaviest, the most difficult to use and clean, and certainly the most expensive juicer on the planet. Before I explain further, you can only get a new model of this heavyweight at the official Norwalk site but it’s also selling used and refurbished models on Amazon and eBay. Shipping isn’t free by the way if you order it on their site. One thing that I would like to commend this product on is the unrivaled juice extraction efficiency. It produces the driest pulp among all types of juice extractors. The Norwalk Model 280 is the successor of the Model 275 and here’s the list of improvements. The tray is now deeper and inclined to prevent overflowing. The Norwalk Hydraulic Juice Press has two parts, the vortex cutter (left side) and the hydraulic press (right side). It’s like a combination of a masticating juicer and a hydraulic press. After you’ve chopped your produce into manageable chunks, drop it down the chute. You may need to gently push it as it’s not self-feeding. The blade will then grate your produce and turn it into a pulp but it still has all the juices. Soft fruits like pineapple, watermelon, pomegranate, etc. don’t need to go to the vortex cutter. The cutter spins at 3450 RPM which require sharpening every once in a while. It doesn’t have to be razor sharp but the edges shouldn’t be rounded. A dull cutter can cause overheating which can affect the quality of the juice. Don’t worry though, for $20 + shipping, Norwalk can sharpen it for you. Once you’ve grated your fruits and vegetables using the vortex cutter, you should immediately catch it with the pressing cloth or pressing bag. A Pyrex cup will also do. Your pressing cloth should never be in contact with metal, using a pyrex pan as a basin is highly advised. It will give you enough room to catch your produce and at the same time fold your pressing cloth. You need exactly two cups of the grated produce in the pressing cloth or bag. Putting in less will not yield an optimum result and exceeding the required amount will rupture your pressing cloth or bag. Once you’ve filled the pressing bag or cloth with two cups of produce, fold it nicely to distribute the force evenly when applying pressure. You need different bags for different types of produce as it gets stained easily. Compared to the Welles Juice Press you don’t need manual force to operate the hydraulic press. You just need to rotate the lever located at the bottom right of the juicing machine clockwise to initiate the press. It uses 1000 pounds of pressure to extract every drop of juice from your produce. In short, it’s not user-friendly. According to one consumer, it takes 30 minutes to clean this machine up. Cleaning up the main parts of the machine is the easy part. All detachable components are made of stainless steel which can go to your dishwasher. The difficult part is cleaning up the filter bags. It feels like doing your laundry without your washing machine. Here are some considerations when cleaning and using the pressing bag. I almost arrived at a conclusion that Norwalk 280 produces the highest juice quality among all juicers but I have to take it back. Though applying the hydraulic pressure is relatively slow, the way it grates the produce is too fast, 3450 RPM to be exact. Compared to traditional masticating juicers maxed at 80 RPM and twin gear juicers at 110 RPM, 3450 RPM can definitely cause more oxidation. I can say that the juice quality Norwalk 280 can provide is just above fast juicers. It’s better than centrifugal juicers but not as good as masticating juicers, and of course, twin gear juicers are still on top of it all. The vortex cutter allows this machine to process all types of produce which include hard fruits and vegetables (soft fruits doesn’t have to go to the vortex cutter). Soft produce includes papaya, grapes, peach, tomato, mango, strawberry, avocado, cranberries, kiwifruit, melon, pomegranate, and blackberry. Citrus fruits include orange, tangerine, lemon, mandarin, and grapefruit. Leafy greens include spring onion, spinach, brussels sprout, cabbage, wheatgrass, pine tree needles, moringa, parsley, lettuce, collard greens, dandelion greens, peppermint, kale, beet greens, and basil. 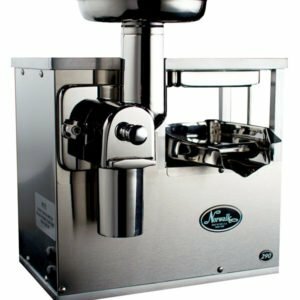 This hydraulic juice press can also be your very own food processor, homogenizer, coffee grinder, nut butter maker, milling machine, and frozen dessert maker. There are eight grids with varying hole sizes included when you purchase this machine to control how fine or coarse your produce will be grated. If you have all the time in the world to prepare your juice and if you’re ready to spend lots of money, then the Norwalk 280 is waiting for you. While the all stainless steel build can justify the price, I’m doubtful about the juice quality Norwalk can offer taking into consideration the speed of the vortex cutter. Due to several reasons, I can’t really recommend Norwalk. It’s difficult to use, difficult to clean, difficult to operate and too expensive. This machine is certainly not for newbies and for those who don’t have the budget. I would rather get a decent slow juicer under $500.